Frieze is the name given to that portion of the wall which occurs immediately below the cornice, down to the picture rail or capping of framing. When made entirely of wood, friezes are not as a rule framed, but usually consist of boarding laid horizontally and fixed by means of a groove and tongue joint to the picture rail along the lower edge, and by a similar joint at the top to the bottom member of the cornice. 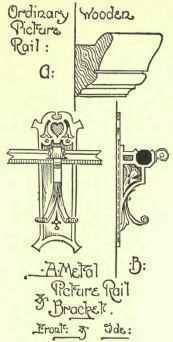 When a frieze exceeds 9 inches in width it is advisable that it be made up of two or more pieces grooved and tongued together, and dovetail keyed at back to prevent casting, as friezes are generally richly carved or decorated. Upright wood backings are provided for securing to wall, and should be placed not more than 3 feet apart. It is seldom that a frieze is of sufficient width to necessitate framed grounds. Wood Cornices are as a rule only used when the ceiling is covered with wood. 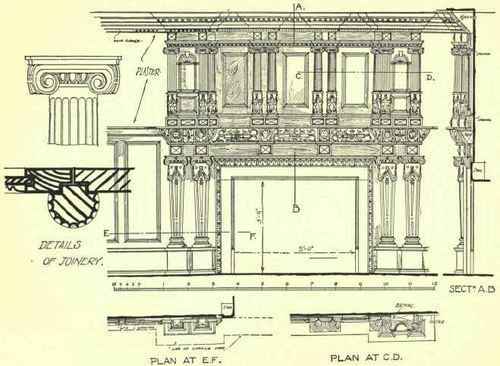 The correct method of forming a wood cornice is to build it up of rectangular pieces of wood grooved and tongued together, and arranged in such a manner, according to the design of the cornice, that the various mouldings may be worked on the salient angles. 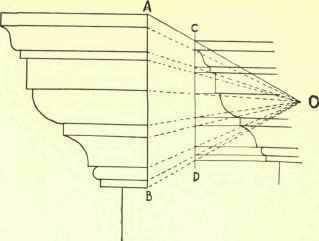 By this method cornices of almost any projection can be formed, the various lengths of the same members being butted, dowelled and glued together and arranged so as to break-joint with the adjoining lengths. Fig. 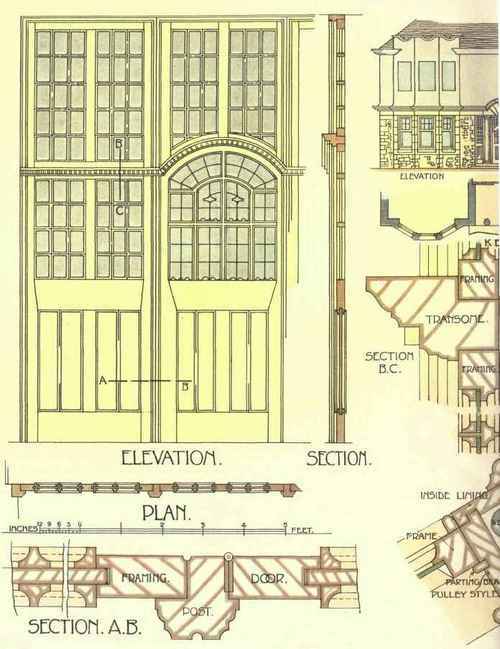 101 gives a simple illustration of a built-up cornice. Great care is necessary in cutting the mitres of a built-up cornice in order to obtain a well-fitting joint throughout the entire depth. It must be placed in the mitre box for cutting, at the exact angle it will occupy when fixed. All angles of built-up cornices should be mitred and dowelled. As it is frequently found necessary in practice where there is much moulded work to either enlarge or diminish the size of a moulding while strictly maintaining the form of each member and its proportion to the whole, the simplest methods of accomplishment are here given. To enlarge a moulding, produce a series of parallel lines from each member as shown in Fig. 102. Assuming the vertical depth x to be 6 inches and the required depth of enlarged moulding 8 inches, take any point A on one of the outside lines, and where the distance of 8 inches cuts the other outside line mark point B. Join these two points, and draw lines at right angles to AB from each point of its intersection with the lines of the original moulding. These lines will give the members of the required moulding, the proper projection being found by measuring the angle shown by the dotted lines and making the angle ABC equal thereto. The diminishing of a moulding is based upon the principle that if a line be divided into any number of parts and each part joined to a common point, lines through which they may pass, and which are parallel to the original line, are proportionately divided. Fig. 102A illustrates this, where the line CD is divided into five parts equal in proportion to the parts of the line AB. For simplicity of illustration we will take the same moulding as Fig. 101, and show the method of diminishing in Fig. 103 to 4 inches. Draw AB vertically, and produce lines from each member to cut it. 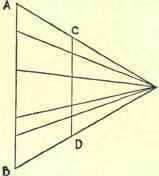 Join the extremities of AB to a common point O, and then draw CD between these lines, exactly 4 inches long, and parallel to AB. 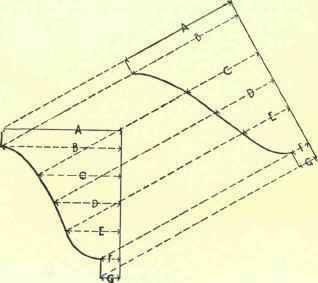 Lines drawn from the divisions of AB to O will intersect CD at the required points, and lines at right angles to CD from these points will give the members of the new moulding, the projection being found as in the case of enlargement. When raking mouldings are mitred with horizontal mouldings, the sections of the former must be altered, otherwise they will not fit the latter. 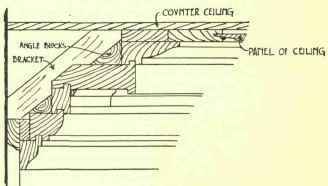 The method of finding the section of the raking moulding from the section of the horizontal moulding is shown in Fig. 104. A number of convenient points are taken on the outline of the horizontal section, and from these points parallel lines are drawn at the inclination of the raking course. A line is drawn at right angles across these inclined lines, and from it the distances A, B, C, D, E, F, and G are set out corresponding respectively in length to the distances similarly figured upon the section of horizontal moulding. Covering ceilings with wood may be accomplished in two or three ways. The simplest form is that of nailing match-boarding to the under side of joists, having the joints running either parallel to the length of the room or diagonally; or it may be arranged to pattern, having a moulding planted on the face to simulate framing. This moulding must be arranged so as to cover all the heading joints in boarding. 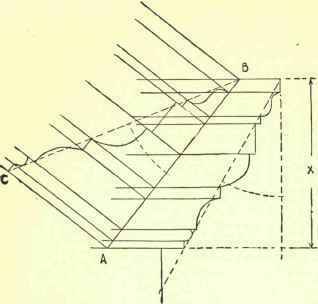 By this method a fair representation of a panelled ceiling may be produced, as shown in Fig. 105. Another method is that of fixing up ordinary framing and panelling, constructed in the same manner as wall framing. This is also fixed directly to the joists, a good plan of fixing being shown in Fig. 106, where the framing is screwed to the joists, a small cover mould being planted on afterwards to hide the screws. The same Figure shows the method of casing an iron girder, wood bearers being fixed at convenient intervals to form an attachment for the framing. The panels should not be fitted tightly into the grooves in framing, but should be given room to shrink or swell without splitting. 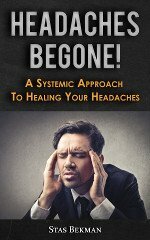 They should be arranged in a convenient size, in order to avoid jointing as much as possible. Where jointed, they must be grooved, tongued, and glued, and have keys fixed across the grain at the back by means of screws in brass slots. It is much better, however, to have a number of small panels in a ceiling than a few large ones, as this part of a room is subjected to a more varying temperature than any other, and the great heat which plays upon it after fires and lights have been burning for some time should always be taken into account when arranging its various parts, so that shrinkage may as much as possible be obviated. The wood should be carefully selected, any having the slighest defect or a suspicion of sap being rigidly eschewed. 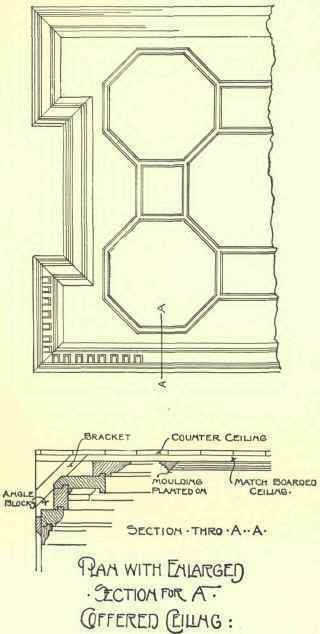 Where recesses occur in a room and the character of the design will not admit of their being included, they are generally lowered sufficiently to allow the cornice to pass them in an unbroken line, and are finished with either an arched or flat soffit. For the construction of a Wood Chimney-piece only a few specific directions can be given, as no two designs are quite alike, and each has to be treated according to the exigencies of the case. 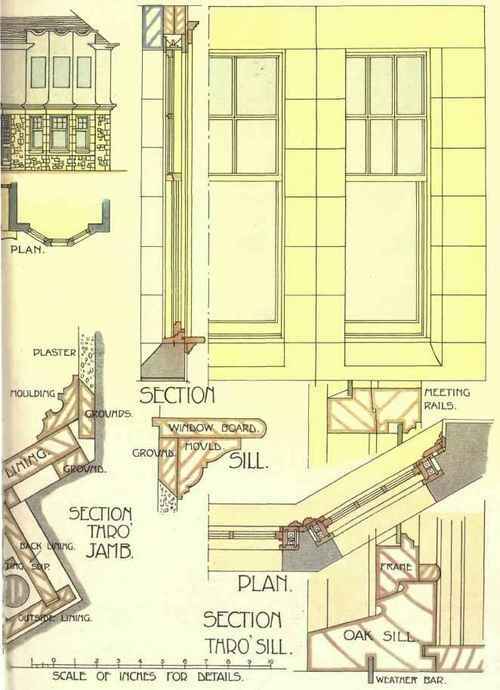 The usual method adopted is to make a framed backing or foundation to the size of the opening, and of such a form that the various mouldings and members, can be securely planted thereon. 1 or 1 1/4-inch stuff is generally used for the frame, although sometimes thicker may be employed, and mouldings are worked in the solid. All mouldings planted on should be fixed from the back and mitred round all brakes, and it is advisable that all mitres in large mouldings be either tongued or dowelled. No wood should be allowed to come close to the ironwork of grate, but should be separated from it by tiles or brickwork, or at least by asbestos sheeting, in order to reduce the risk of fire. Cracks in the woodwork and open joints are frequently seen in wood chimney-pieces, but this is not always due to faulty construction; for while it is essential that only the best quality wood be used, and put together by a skilled workman, it is nevertheless easy for both material and workmanship to be ruined by incompetent fixing. A wood mantel should on no account be fixed in a new building until the walls and plaster to which it is to be attached are thoroughly dry. If fixed earlier, when a fire is lighted the hot moisture collecting at the back of the woodwork is calculated to ruin the best possible specimen of joinery. The additional precaution should in all cases be taken of painting the back of the woodwork prior to fixing. An example of a wooden mantelpiece overmantel is shown in Fig. 107.